Presentation materials and the Museum of Art’s materials were distributed. With some images and video, Mr. Yoshimoto had introduced some of the programs of Cultural Olympiad in 2012. In Japan, naturally, the journalism seemed to feature only the actual Olympic games, but I realized how vigorous program they had. There were artists from all the 204 countries and regions where athletes had come from. The program was held in various venues throughout the country, not only in the cultural facilities but also in the historical monuments, squares in the cities and outside or in the nature. Most of them were open to public for free. If you are a UK citizen, you could have participated in the Olympics through culture. I was impressed to hear that. As a result, despite of the various regulations, the program seems to introduce well the history and culture of England. What should we do for Tokyo? For the Tokyo Olympics, a target value is already set: “To hold 200,000 cultural events.” It’s not easy to achieve just in Tokyo, and it’s not something unrelated to us who hold activities outside of the cities. Presentation “Activities and Approaches of Japan Foundation” that introduced the programs organized by Japan Foundation towards 2020. The programs organized for Olympics by Japan Foundation, especially that of Asia Center were introduced. Japan Foundation promotes the exchange between Japan and other countries. The Asia Center was established in 2014, in order to drive forward the exchange among the ASEAN countries. Mr. shono had talked specifically about the meaning of expanding the projects by combining the locally-rooted projects or platforms with the networks of Japan Foundation. Questions from the participants were answered by the speakers. Kochi Prefecture has released the proposal to the Olympic and Paralympic. Would it be taken into consideration? It would be important to set up local arts council or equivalent organization to propose any ideas to Agency for Cultural Affairs. How was the program of the Cultural Olympiad and London 2012 Festival? Were the events mainly of famous artists or groups? Not many participants were aware whether the event was of the Cultural Olympiad or not. They tended to join in without knowing it was. There were local community events counted in the program, such as “community dance” which involved sports and arts. How were the suburban or regional cities from London involved? From the beginning of their planning, did they already have intentions to increase the tourists? Majority of participants to most events were the locals. The international audience had increased for events with a broader scale. After the London Olympics, the number of tourists had increased, but it was the very rare result. In the research conducted later, 80% of the answers were “it was an event that motivated the young.” It should never be underestimated that the new perspectives, encounters, and experiences born in and after the event may remain even afterwards. The artists are there, and they exist. However, it’s questionable if there is an environment that supports their activities and creation. 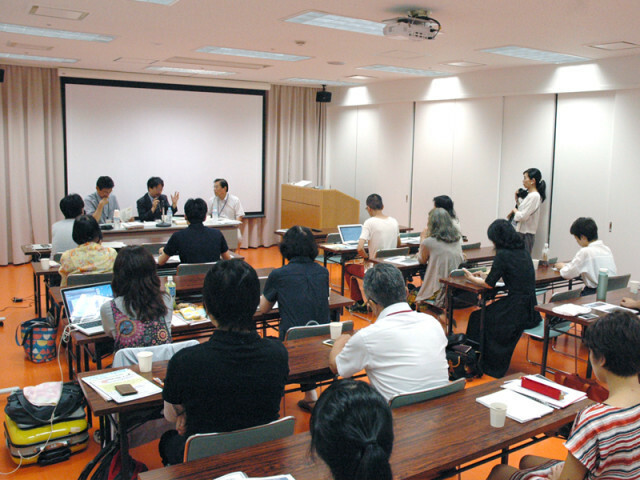 What are ”BUNKA GEIJYUTSU ASSOCIATES”(the Arts and Culture Associates） advocated by the Agency for Cultural Affairs? To grow the human resources that can lead “the BUNKARYOKU PROJECT”（Power of Culture). They have an intention to increase the local arts councils. The voice from the private sector should also be heard. – Participants are divided into 4 groups with 6 to 8 people. Each group will conduct 15-minutes discussion on the given topic. – The person who speaks will take the object from the center of the table, and when she/he finished the speech, the object needs to be returned at its original position. While someone is talking, others may not intervene. – When the people who are listening hear something interesting, they are free to take notes on the paper given on the table. – When 15 minutes pass, one of the group members will remain at the table, while others will move to different tables. – With new members and new topic, they will have 15-minutes discussion. 2.What can be appealing about Kochi to the Southeast Asia? The people. Atmosphere that connects the artists with the community. Not easy to access. People rarely arrive without determined purposes. It would be better to start with promoting domestically, rather than to Asia. “Yosakoi” is the composite art. With “Yosakoi”, can’t we organize something like World Cup or Carnival? It would be interesting to involve the migrants as well. The authentic “Yosakoi” should be differentiated from any other “Yosakoi” events held all over in Japan. In Indonesia as well, “Yosakoi” is practiced. How about inviting the local teams to the home of “Yosakoi”? It might help getting to know about Kochi. At the Art Zone Warako Warehouse, the participants had visited Takogura (ex-straw storage: renovated as a small theater), with introduction by Takehiro Fujioka, one of the boards of NPO Takogura. Then, lunch at Tosa Bar. Visit of Katsuo Guesthouse with the concierge, Maki Maeda. The interior construction was done in collaboration with her artist friends. It’s known for the original works of each room. Visit of Sawada Mansion (worldly renowned self-built building) on its own, following the map. At the Gallery room38 on the first floor, they are holding interesting exhibitions such as the one of Yoshitomo Nara in 2014.